Myth:	Professional licensure keeps professions exclusive and inaccessible. Fact:	There is no profession in the world that does not wish to increase its numbers. In the accounting profession alone, there are more than 650,000 licensed certified public accountants. The accounting profession is working tirelessly to increase those numbers. Similarly, no professional in the learned professions (Medical, Engineering, etc.) is likely to say they wish fewer people would join their fields. In fact, the only thing these professions want more than additional members is for those who make up the profession to be qualified so they safeguard those they serve. If that desire for public protection disqualifies some from practicing a profession, all professions can—and should—live with that. Myth:	We didn’t used to need so many licenses to be productive workers. Fact:	A major reason licensure has become critical as time has gone on is that our economy has become a knowledge economy. And knowledge economies are always changing. These days, even many trades depend upon a constant development and updating of skills. But such evolutions are especially true in the professions where technology, innovations in best practices, and client needs and expectations rapidly shift. Licensure reassures the client, that an individual has kept pace and is therefore more capable, reliable, and trustworthy to that client. Myth:	Professional licensure is just another regulatory burden we don’t need. Fact:	While some regulations are certainly unnecessary, we dismantle professional regulation at our risk. The most egregious examples of malfeasance or malpractice nearly always stem from the violation, or ignorance, of professional regulations¬¬—the 2008 financial crisis being the most recent proof of that. Professional regulation ensures life savings aren’t lost, medical prognoses are made accurately and without conflicts of interest, and buildings and bridges are constructed safely by those with knowhow. Myth:	Having to obtain a professional license prevents people from earning a living. Fact:	On the contrary, professional licensure offers an individual greater protection from all the forces arrayed against the modern worker: automation, globalization, low wages. When someone hears the call to join a profession and works hard to continually earn and uphold its licensing standards, that individual will not only enjoy the ongoing rewards and challenges of his/her work, but a greater security because he/she is maintaining relevance and value. Myth:	Doesn’t licensure create a two-tier system of access, though? People who are licensed professionals versus those who aren’t? counsel, cutting-edge knowledge, strong accountability, and recourse should an issue arise. Myth:	Isn’t professional licensure a modern phenomenon, though? Fact:	No. The accounting profession, for example, saw the virtues in licensure and the regulation of its profession starting in 1896. 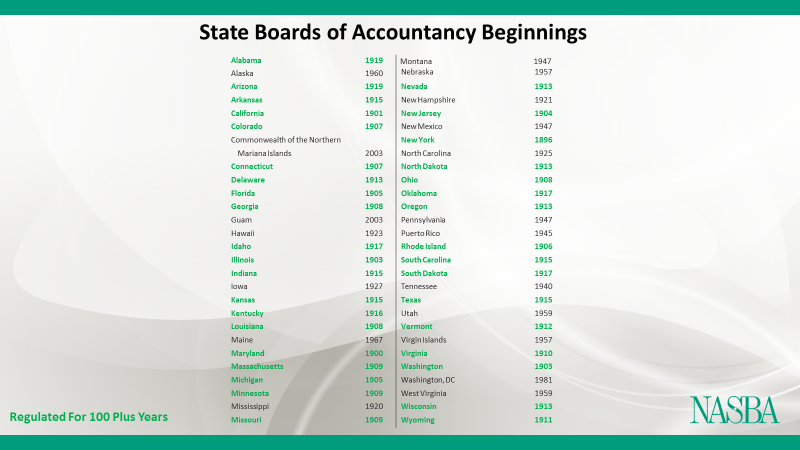 In fact, of the 55 State Boards of Accountancy in the United States, 36 of them have been in existence for more than 100 years. The fact is society has always endorsed licensure and regulation, even at the simplest levels. Take your driver’s license, for example. We as a society do not permit just anyone to drive because we have a responsibility to the safety of those on the road with whom every driver interacts. While we certainly could get rid of driver’s licenses in order to “deregulate” our society, what kind of chaos would that invite? The same is true of professions. Myth:	If you believe in the free market, you can’t believe in professional licensure and regulation. Fact:	Free markets are only truly free when they’re safe and everyone plays by the rules, which are available to all and discriminate against no one. That safety depends on those who fully understand a particular field to look out for the well-being of those who don’t. That’s where the licensed professional comes in. Put another way: A person may be “free” walking around an unfamiliar and dangerous neighborhood, but no one would advise it or call that freedom. And that kind of danger—where there is a lack of trust, no one is monitoring for safety and security, and navigating the best course of action is prone to undependable advice—is what professional deregulation would feel like in real life. Myth:	Is joining a profession really all that different from other jobs, especially jobs that don’t require a license? Fact:	Professions are callings, which is why those who pursue them believe it’s important to hold themselves to a higher standard of education, experience, examination, ethics, and continual professional development. What they seek to do is not transactional; it is, instead, a lifelong commitment to pursuing excellence in a given field. Licensure is a way to both take the measure of that commitment (those who aren’t passionate about their profession usually don’t wish to do the hard work of becoming licensed), as well as cohere and police those called to it. A professional is a professional because he/she relishes the demands of his/her field and its aspect of service. Myth:	Professions benefit from having information others don’t, and they want to keep that information to themselves to maintain influence and control. Fact:	Professionals are the very opposite of adversaries. They seek to level the playing field of knowledge to the advantage of those who are not knowledgeable. All of us reach out to professionals when we find ourselves in unfamiliar territory and want to be treated fully, fairly, and reliably. The expertise professionals achieve through licensure is the very thing that makes it possible for us to count on them as our best advocates and allies. Myth:	Professional malpractice insurance, online reviews, and litigation are enough of a safety net for the consuming public. Fact:	Learned professions require the highest standards for protecting consumers, investors and patients because these professions involve some of the highest-risk services in our society. The professionals—accountants in regard to financial health, physicians in regard to physical health, and attorney in regard to legal affairs, and others—all provide services and use titles that carry unparalleled weight when it comes to trust, reliance and care. Assuming malpractice insurance or online reviews by an uninformed public—and/or forcing consumers, investors and patients to resort to litigation at their own expense because there was no oversight—is not just naïve, it’s harmful. Especially when considering the type of work these professions handle. Myth:	Professional licensing rules are inconsistent and unpredictable from state to state. Fact:	The accounting profession has spent three decades promoting and increasing uniformity across 55 U.S. states and territories. As of 2018, all of these jurisdictions have substantially equivalent requirements to enter the profession: An aspiring accountant must take and pass the national Uniform CPA Exam, complete 150 hours of education with a significant portion being in accounting and related subjects, and have at least 1 year of relevant experience in the field. In other words, an individual looking to become licensed as a CPA will find minimal variation in the path to becoming a CPA regardless of where he applies to be licensed or where he practices. Myth:	Professional licensing erects unnecessary barriers to interstate mobility, thereby limiting competition and access.